Thanks to all of the contributors from around the Planet! Weta is best-known as the special effects company responsible for the effects work in the new Planet of the Apes films, as well as Peter Jackson's King Kong and the Lord of the Rings films, and many, many more. Their work is outstanding. Weta Workshop is a branch of Weta that does design and manufacturing for various films. 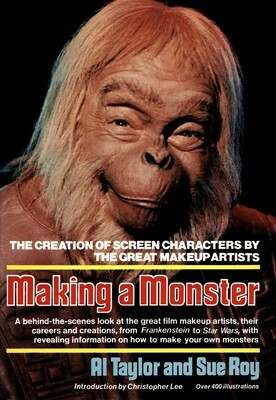 They also offer film-related collectibles, replica props, costume replicas, jewelry, and more. 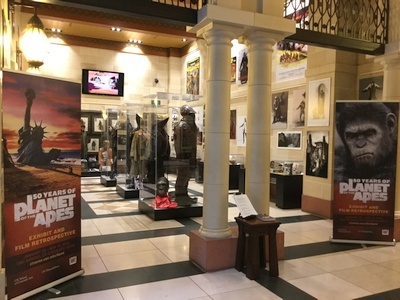 Last year, Weta Workshop rolled out a number of Planet of the Apes collectibles related to both the original films and the new trilogy. 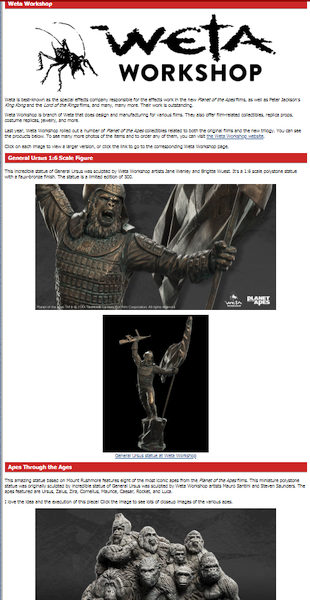 You can see the products on the new Weta page here. 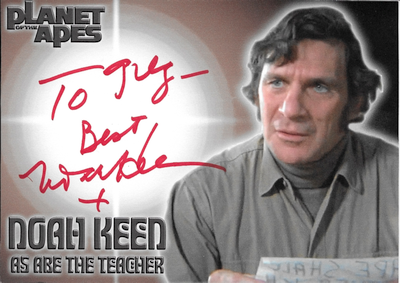 Greg Champy sent in a card signed by Noah Keen, who played "Teacher Abe" in Battle for the Planet of the Apes. Sadly, Noah died on March 24, 2019. A brief obituary can be found here. 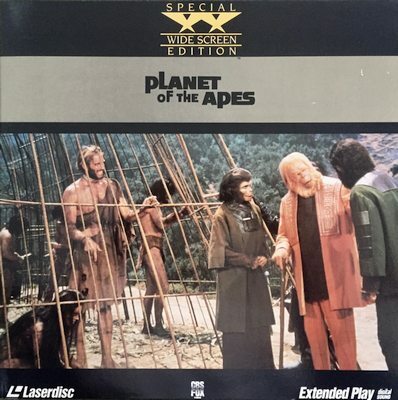 Harry Barnes and Lori have contributed images of many of the Planet of the Apes LaserDisc releases. There were additional re-releases in the U.S., and I hope to add those images soon. 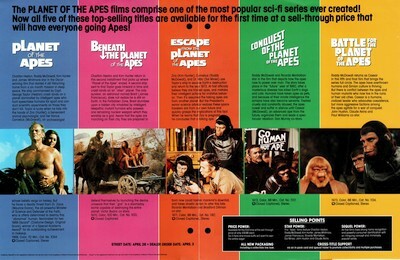 You can see them on the Apes LaserDiscs page. Artist Jay Rogers has contributed three more of his acrylic paintings recreating the Marvel comics covers. You can see his paintings here. Be sure to check out the links to Jay's other work, too! 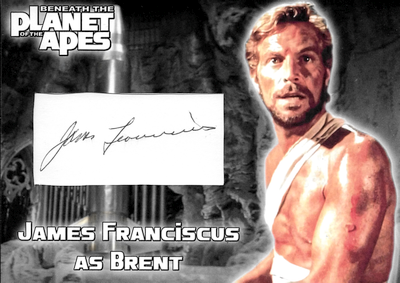 Thanks to Greg Champy, two more autographs from his collection have been added to the Autographs page: James Franciscus and another Ron Harper. Greg is also responsible for the graphics in the site's facelift today! 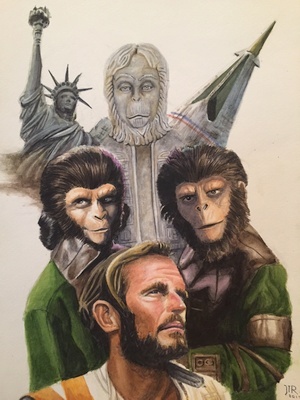 Thanks to Harry Barnes, a German pressbook for the release of Battle for the Planet of the Apes has been added to the International Pressbooks page! Harry also sent in a set of German lobby cards for Battle. They are the same images found on the French lobby cards. They can be seen here. 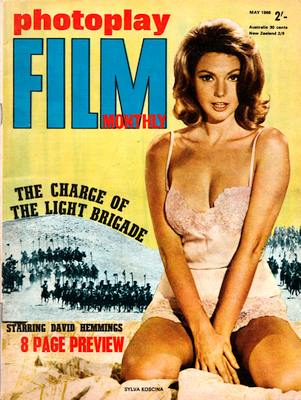 Thanks to Neil Foster, scans of a Photoplay Film Monthly article from the May 1968 issue have been added to the Magazine Articles page! The article covers Charlton Heston and the first film. 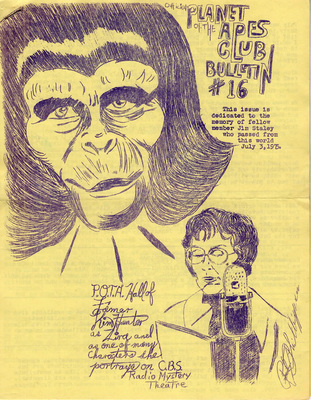 In the mid-1970s, Bill Woodruff published The Official Planet of the Apes Club Bulletin. The mimeographed pages were mailed out monthly. Thanks to Lori, Club Bulletin numbers 16–23 are now available for your nostalgic viewing pleasure! If anyone has issues 1–15, let me know! Thanks to Lori, more CBS-Fox ads have been added to the Advertisements page. 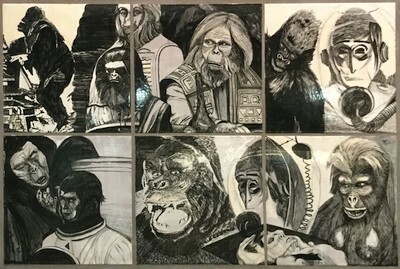 Thanks to Lori, photos of Apes tile art in the L.A. Metro have been added to the Exhibits page. 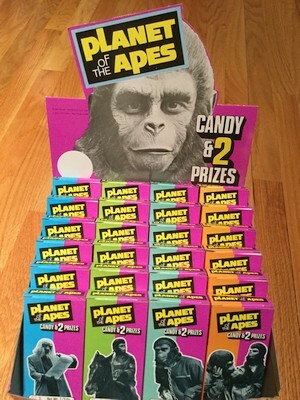 In 1976, Phoenix Candy released Planet of Apes boxed candy and prizes. Thanks to Lori, photos of these boxes and prizes have been added to the Collectibles page. 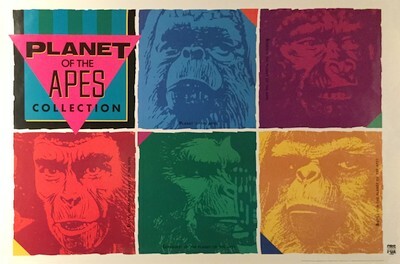 Lori sent in these high-res photos of the Planet of the Apes Colorforms set from the mid-'70s. They've been added to the Collectibles page. 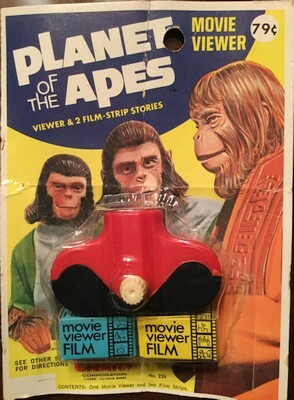 Lori sent in these high-res photos of the Planet of the Apes Movie Viewer, including scans of the filmstrips, which I'd never seen before! They've been added to the Collectibles page. 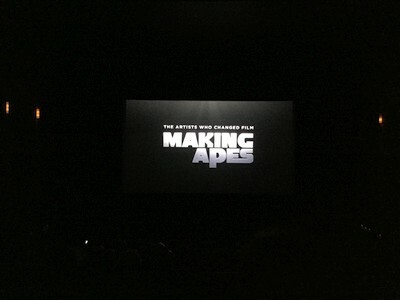 The premiere of William Conlin's Making Apes documentary took place on Friday, February 8, 2019, at the Santa Barbara International Film Festival. Lori was able to attend, and she sent in some photos she took at the event. Lori also video-recorded the Q&A panel at the end of the screening! The video can be found at the bottom of the event page, as well as on YouTube. 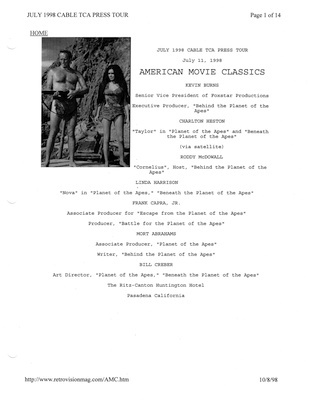 Lori has contributed more vintage ads promoting the Super8 films and the video releases. They've been added to the Advertisements page. Lori submitted some photos she took at the 1999 Electronic Entertainment Expo (E3) in Los Angeles. 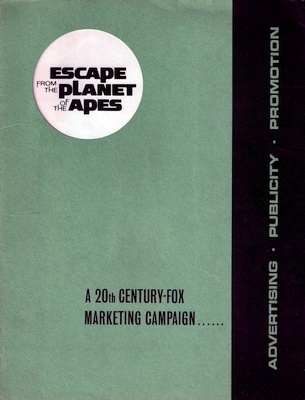 Fox Interactive was promoting their Planet of the Apes game, and ApeMania was there in-costume. 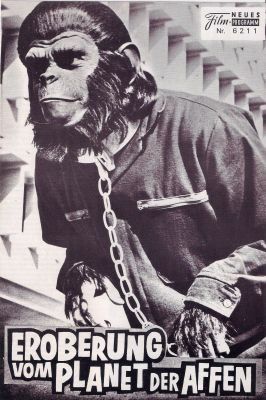 Planet of the Apes at E3 1999 in L.A.
Harry Barnes has contributed scans of more international lobby cards! You can find lobby cards from all over the world on the Lobby Cards page! Thanks to Lori, photos from a bunch of Apes-related events have been added to the brand-new Apes Events page! Lots of great photos there! Check them out! 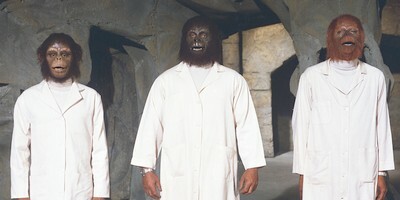 Thanks to Lori, photos from a bunch of Apes-related exhibits have been added to the brand-new Apes Exhibits page! Lots of great photos there, too! Check them out! 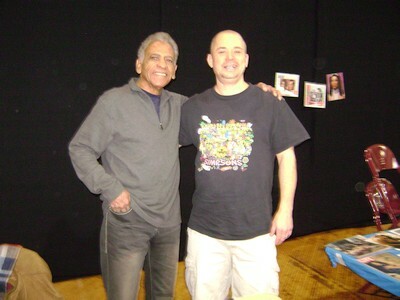 Gregory Sierra as "The Verger"
They can all be found on the International Pressbooks page. Today's additions have been noted with the add date of 2019-01-22. Mark Talbot-Butler has contributed another 192 high-res scans of stills and behind-the-scenes photos from all of the original films and TV shows! They can be found on the page below. All of today's updates are on new pages, identified by today's date. This brings the total number of high-resolution, downloadable images in Mark's collection to over 2,400! 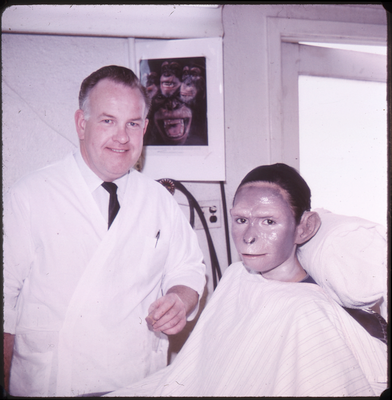 Mark Talbot-Butler has contributed high-res scans of photos of the makeup tests done for the Planet of the Apes test reel that was commissioned by Fox as a "proof of concept." 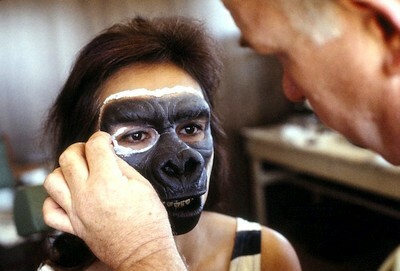 Mark Talbot-Butler recently acquired 73 Planet of the Apes-related slides that were originally owned by John Chambers, who designed the makeup effects for the first film. Some of these have most likely never been seen before, so check them out! 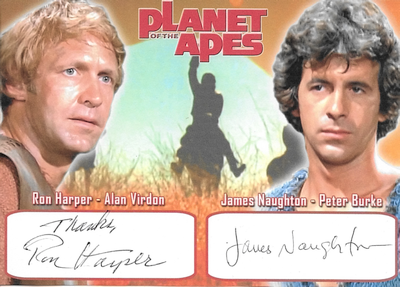 Thanks to Greg Champy, a few more Apes Autographs have been added to the Autographs page! Lori has contributed what is, IMO, an amazing project! She and a friend recently prowled the streets of Hollywood looking for Walk of Fame Stars for people associated with Planet of the Apes! 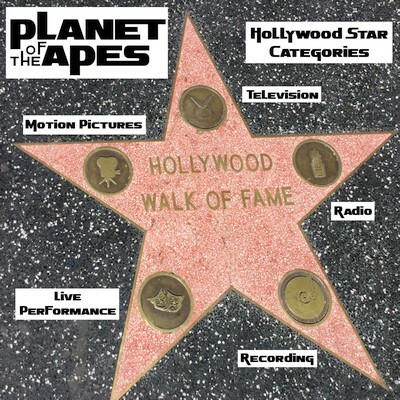 You can see her photos of the Stars on the new Hollywood Walk of Fame Apes page! The address of each star is also documented there. Artist Jay Rogers has contributed three more of his acrylic paintings, one recreating a Marvel comics cover, and two originals. You can see his paintings here. 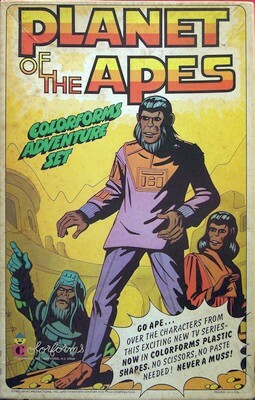 Thanks to Lori, the last of the Apes coloring books has been added to the Coloring Books page! This was the coloring book I owned as a kid, so I'm glad it's finally represented here. Many of the pages in the book are found in the other books, but there are some unique to this book. These are fresh, 300-DPI scans, and you can download either a CBZ or a PDF of the file. 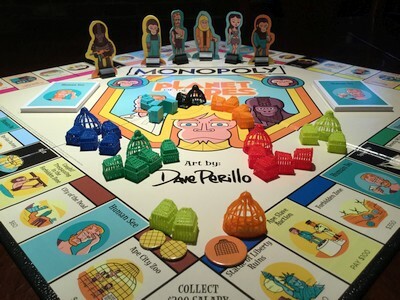 Lori thought the Planet of the Apes Monopoly game released last year (featuring "retro art" by Dave Perillo) would be more fun if the cardboard cages and corrals were replaced by actual corrals and cages. To that end, she came up with some files to 3D-print game pieces using a 3D printer! Her files are available for download now from the Monopoly 3D page, along with photos and images showing the settings and other instructions. Here are some more articles culled from magazines uploaded to Archive.org. Thanks to Lori for taking the time to find and gather all of these! 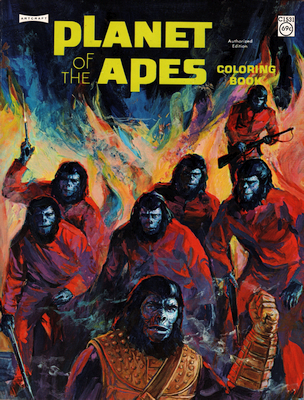 Thanks to Angela, scans of the colored version of the Apes parody from MAD #157 are now available in PDF and CBZ formats at the bottom of the Magazines page. The pages were colored by MAD for a reprint book published some years ago. Artist Jay Rogers has contributed two more of his acrylic paintings recreating the Marvel comics covers, along with some original work. You can see his paintings here. 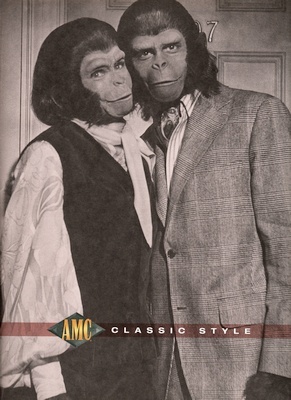 A dedicated Apes fan recently spent more time than I would have trawling through magazines uploaded to Archive.org to find classic Apes content. Thanks to her efforts, 45 new articles and book excerpts have been added to the Magazines page! I still have another dozen or so to add soon. Thanks to Greg Champy, scans of the Mexican TV trading cards put out by Lyausa are now available. The cards are identical to the U.S. TV show trading cards, except that they're in Spanish. You can view the scans here. Yesterday was Roddy McDowall's 90th birthday. To celebrate, I uploaded some video footage of Roddy that he did for the Sci-Fi Channel, back in the '90s, when it was still called Sci-Fi Channel. 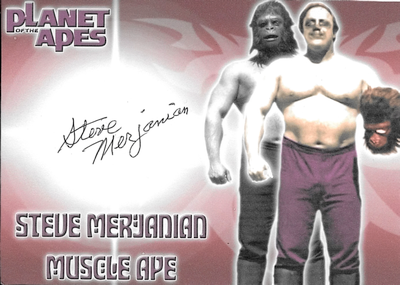 The first video is over an hour of raw footage recorded of Roddy as host of "Apes Week". The second video is the footage that actually aired, and the third video is footage from when the TV series was aired. Here's something you don't see everyday! 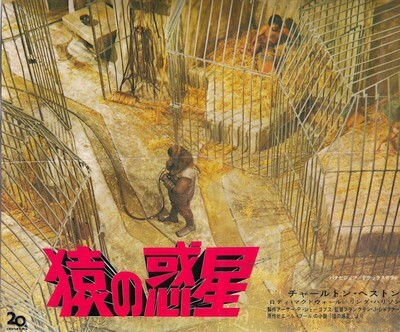 Here's a 1968 Japanese Manga magazine promoting the original Planet of the Apes film! I know nothing else about this, so if you have more knowledge, please let me know! Thanks to Lori for the scans! It's been added to the Magazines page. 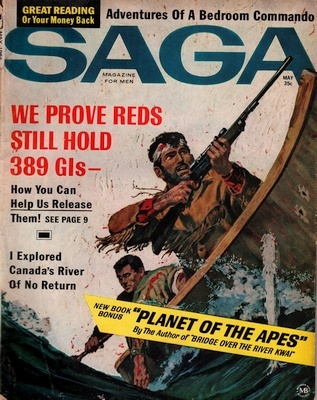 Way back in May 1964, Saga: Magazine for Men ran an abridged version of Pierre Boulle's original novel that inspired Planet of the Apes. Thanks to Lori, scans of the abridgement are now available for your reading pleasure! 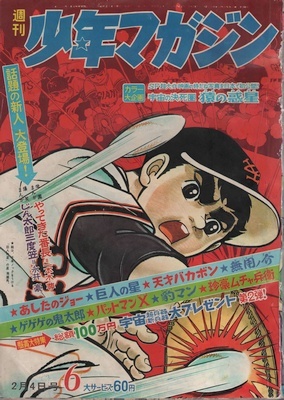 It's been added to the Magazines page. 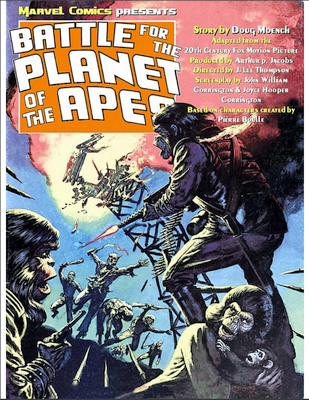 Thanks to JamesA1102, his PDF version of Marvel's adaptation of Battle for the Planet of the Apes is now available. Thanks to Lori, scans of Toys from the Attic, Catalog #3, September 1995, have been added to the new Catalogs page. 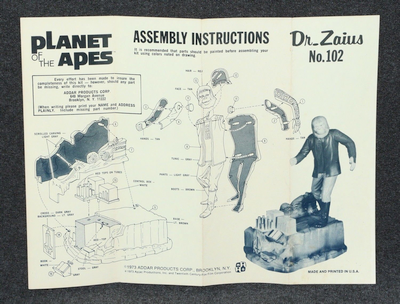 Toys from the Attic is a price-guide/checklist of Apes memorabilia. Thanks to Lori, scans of the July 1998 AMC Cable TCA Press Tour transcript have been added to the AMC 30th Anniversary page. 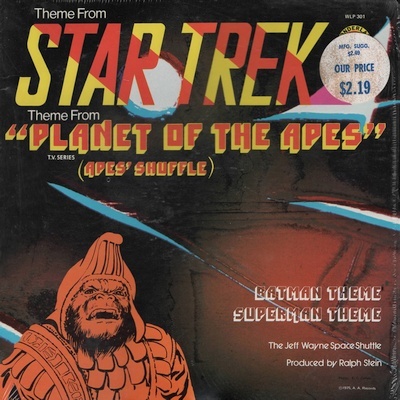 Thanks to Lori, scans of the Wonderland Records release of "Apes' Shuffle" have been added to the Soundtracks page. Artist Jay Rogers has contributed his acrylic paintings recreating the Marvel comics covers, along with some original work. You can see his paintings here. 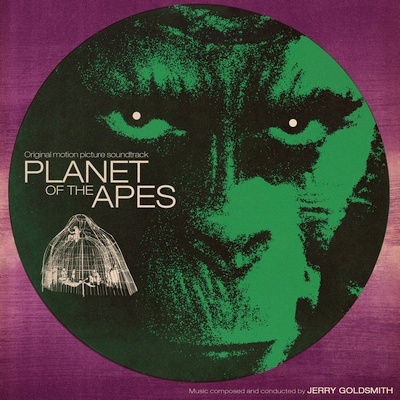 Stéphane Coëdel sent in some custom covers he created for the Apes soundtracks that were inspired by the Polish Apes poster by Eryk Lipinski. You can see his covers here. Be sure to check out the links to Stéphane's other work, too! 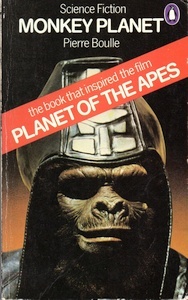 Rick Lafreniere sent in scans of the 1975 UK mass-market paperback edition of Monkey Planet. They've been added to the Books page. Thanks, Rick! 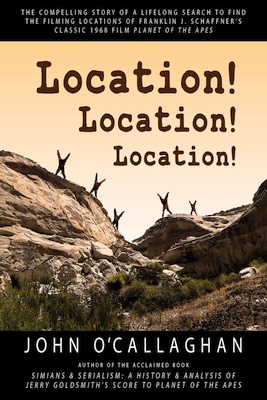 New from Pithikos Entertainment: John O'Callghan's Location! Location! Location! 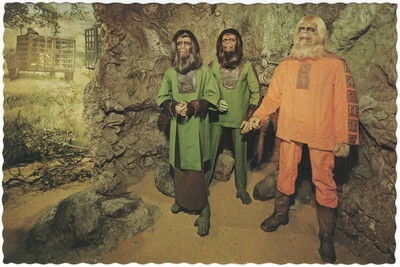 The Lifelong Search to Find the Filming Locations of Franklin J. Schaffner's Classic 1968 Film Planet of the Apes. The book is scheduled to ship the first week of October 2018. 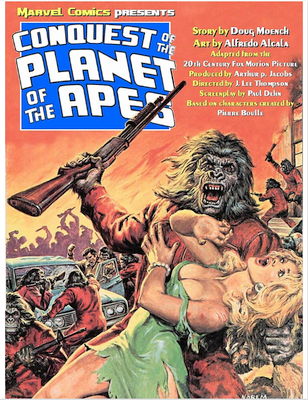 AFTER 50 YEARS, APES FANS STILL HAVE QUESTIONS! Ever wonder what became of those giant Scarecrows? How about those oak trees Taylor saw at the top of that mesa? Do you want to know what was shot and not used? Want the dirt on shots planned but not filmed? In LOCATION! LOCATION! LOCATION! 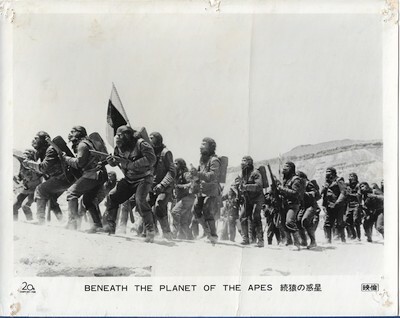 author John OCallaghan answers these questions by sharing his life-long journey to find the exact filming locations for Franklin J. Schaffner's classic 1968 film, PLANET OF THE APES—including the recent discovery that several key sites in the badlands of Utah haven't been touched by Man (or Ape) since the crew finished shooting in 1967. 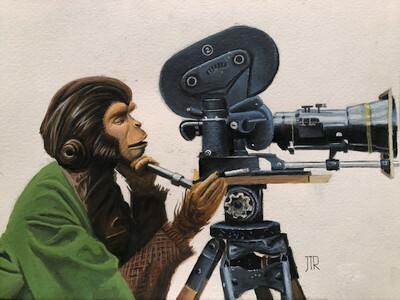 Incredible discoveries and previously unknown research about the work of filmmaker Franklin J. Schaffner provide clarity and humor to the history before, during and after the three-month shoot of Planet of the Apes. ***PLEASE NOTE: This book will ONLY be available as a Trade Paperback Book SOLD EXCLUSIVELY through the Pithikos Entertainment website. 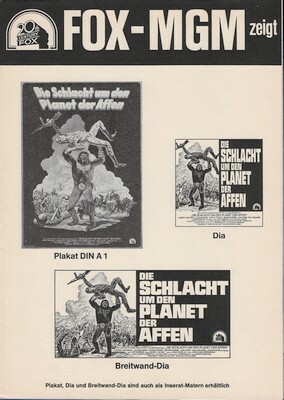 Thanks to Harry Barnes, a German Illustrierte Film Bühne for Planet has been added to the International Pressbooks page. Thanks to Harry Barnes, three vintage ads for the films from UK newspapers have been added to the new UK Ads page. 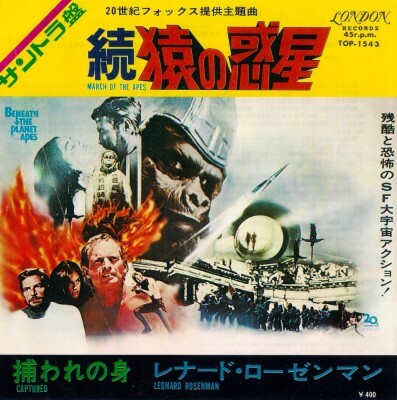 Again thanks to Harry Barnes, images of a Japanese 45 RPM single for the soundtrack to Beneath has been added to the new Soundtracks page. 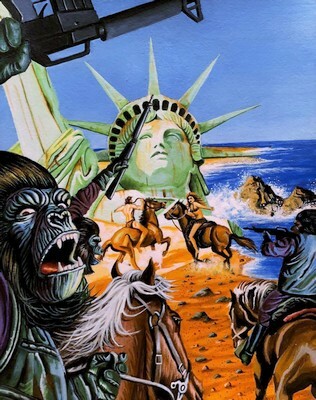 Thanks to JamesA1102, his PDF version of Marvel's adaptation of Conquest of the Planet of the Apes is now available. Look for Battle next month! 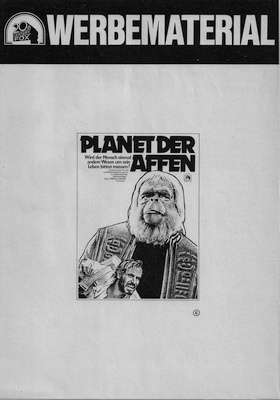 Thanks to Harry Barnes, scans of all five pressbooks for the German re-releases of the Apes films have been added to the International Pressbooks page! 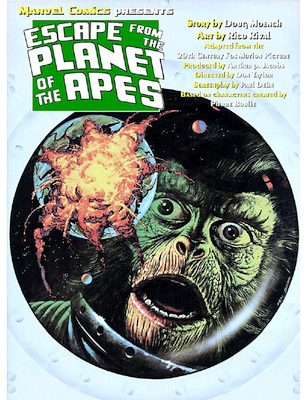 Thanks to Harry Barnes, scans of all five UK pressbooks for the Apes films have been added to the International Pressbooks page! 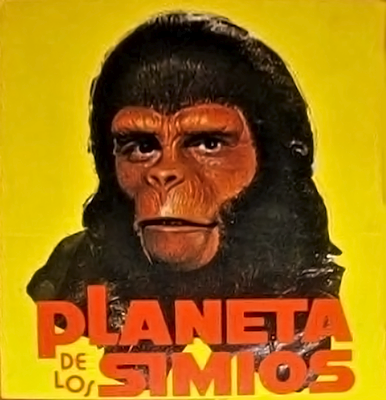 Thanks to Harry Barnes, scans of eight Argentine lobby cards for Beneath the Planet of the Apes have been added to the Lobby Cards section. These cards have the censors' stamps on them! The documents are available in both PDF and CBZ formats. Enjoy! 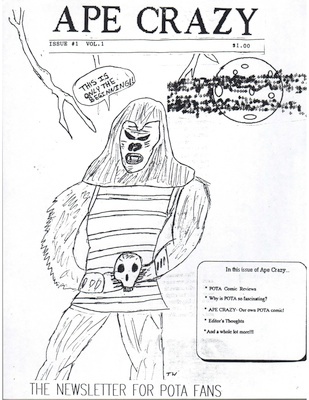 Thanks to Terry Hoknes and Lori, scans of all seven issues of Ape Crazy are now available for your reading pleasure! 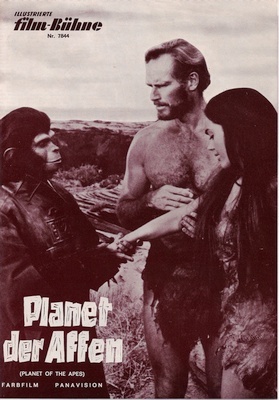 Ape Crazy was a Planet of the Apes fanzine published in the early 1990s by Mark and Tim Waszylysn. Click here to download the issues. The issues are available in both PDF and CBZ formats. Thanks to Lori for bring the fanzine to my attention, and thanks to Terry for supplying the PDFs! 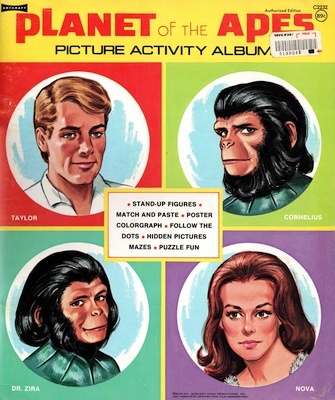 Thanks to Lori, scans of the Planet of the Apes Picture Activity Album have been added to the Coloring Books page! There's still one coloring book not on the page, but its contents are identical to the pages of the other books. Still, I hope to add a compilation of that one soon. 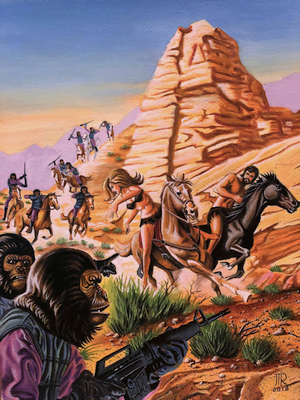 Thanks to JamesA1102, his PDF version of Marvel's adaptation of Escape from the Planet of the Apes is now available. James will be releasing PDFs of Marvel's comic versions of all five original films, one a month for the next few months. 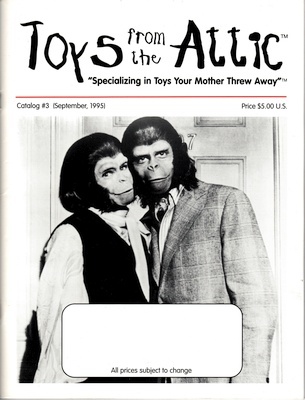 Thanks to Lori, scans of thirteen Apes-related magazine articles have been added to the Magazines page! 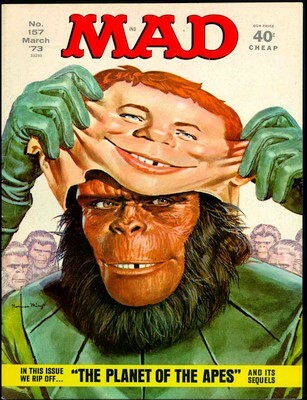 Of particular note is Epi-log Journal #9, which is a 42-page article about the Apes movies, TV series, and cartoon! 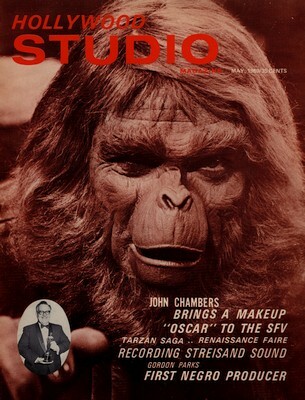 Also, Starlog #105 contains the first appearance of Joe Russo's and Larry Landsman's project that became the book Planet of the Apes Revisited. Thanks to Harry Barnes, we have several new additions today! 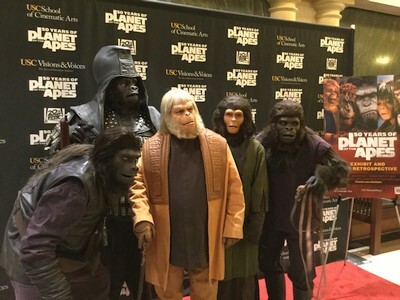 Thanks to Lori, over 100 photos and videos of the USC 50 Years of Planet of the Apes Exhibit, which was held from January through May 2018, are now available for your viewing pleasure! Note: The files and images on this site are made available as a reference for fans. Most of these items have not been commercially available for 40 years or more, if they were ever commercially available, and no profit is derived from this site. It is a fan-run site for entertainment purposes only. 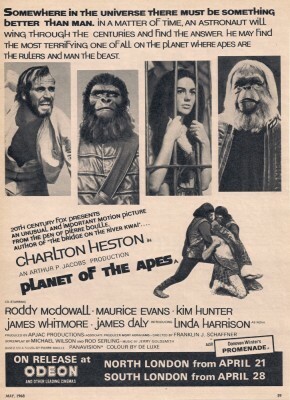 Planet of the Apes is owned and copyrighted by 20th Century Fox.